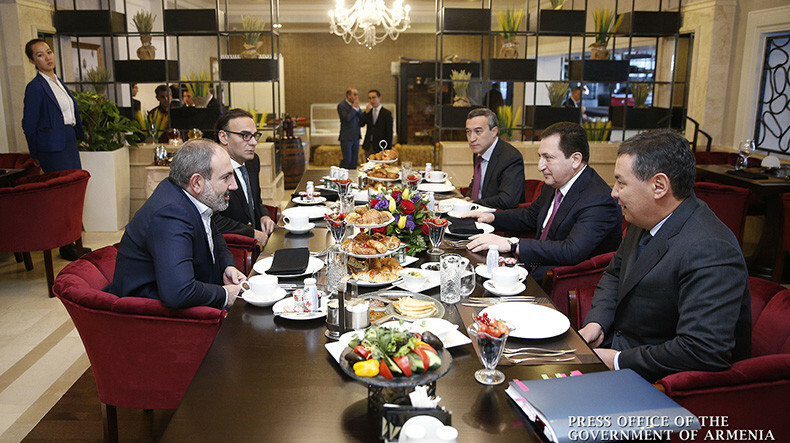 Acting Prime Minister of Armenia Nikol Pashinyan on Friday had working breakfast in Astana with Atameken Chamber of Commerce member, Chairman of Oil and Gas Industry Committee Abulfazin Daniyar Rustemovich and Mosstone Engineering Company Director David Galstyan. The interlocutors discussed issues related to cooperation prospects in the energy sector. They touched upon the opportunities available on the Armenian market, and the government’s steps aimed at improving the business environment, the PM’s office reports. The Kazakh side expressed interest in making investments in Armenia. Welcoming the initiative, Pashinyan suggested discussing the matter with Armenia’s relevant government agencies in order to identify and outline the steps to take ahead. The meeting looked at ways of exporting Armenian products to Kazakhstan.